Where can I source my fabrics? Where can a source my fabrics? Now, the first thing I want to address is…don’t go to retailers to source your production fabrics! This may sound obvious to some, but you would be surprised how many new designers go to their local haberdashery or fabric store to pick up fabrics in hope to make their first samples. This is fine if you intend to make one of pieces or the fabrics are easy to get hold of in larger volumes. However, you will get yourself into a sticky situation, if the pink and blue polka dot stretch satin that you used across your entire collection of knickers and bras was bought from Mr Smiths Fabric Store and Mr Smith doesn’t want to sell you 50meters at cost price when you return to buy your production fabrics. You then try to locate this fabric from the original wholesaler but to no avail. If this happens you may have the awkward task of explaining to your buyers that the beautiful collection of knickers they have ordered from you is now going to be in a different fabric. Not a good start! Now! Lets get it right from the beginning. To do so there are 5 key questions you need to work through. 1: What is the ‘look’ and function of the fabric or component? As a designer you will have a good idea of how you want your garments and fabrics to look and feel. So we are halfway there. It is also imperative that the properties of the fabrics and how they will support the functions of the garments have been considered. If you are unsure, a garment technician like myself will be able to assist you in determining the key technical details essential in each material. For example an under-wired bra needs to have a stretch fabric such as power mesh for the wing (the bra back) and preferably a rigid front cradle and cups. Without these technical fabrics the bra will lack the comfort and support needed. As mentioned before, a garment technician can help you dissect the garments in your collection and give you a breakdown of the technical requirements of each fabric and component. To give you a helping hand I will be writing a separate article on this subject, so feel free to subscribe and I will ping you an email to let you know when the juicy stuff is live! 2: What is the size of your production order? This will help you narrow down your potential suppliers as some offer low MOQ’s (minimum order quantities) whilst others are much larger. The latter may be more cost effective but not usually feasible for many start-up lingerie brands as their minimums can start at several thousand meters or units. 3: Will they have this item as a continuous line? Just imagine, your collection has been spotted on the hottest new girl band: Herb Girls (see what I did there!). They are seen gyrating in your beautifully designed under-wired bras and cheeky knickers in their latest music video and now everyone wants to order your lovely pieces. You have sold out and demand is still high (I know you have envisioned this already, go on admit it! ), but that is ok the factory are able to slot you in for a fast repeat order. Phew!! Now, lets quickly order in some more of that polka dot fabric (now bought at wholesale now of course), but hang on…they have stopped producing that line of fabric and it is so unique you are unable to locate it anywhere else. What do you do? Well in hindsight you should have anticipated this before your first production run. It is essential to find out if the line is continuous. If it isn’t, then you need to do the maths on whether it is best to buy a larger quantity on the assumption you will be putting in a repeat production order of your garments. 4: What is the fabric supplier’s lead-time? Quite often the fabric or component is in stock and ready to buy, in which case the main consideration is the delivery times, which usually comes from overseas. However this is not always the case, so ensure a delivery date is determined early to ensure production with your factory can go as planned. Any delays in fabrics may result in you losing in your production slot and possibly deposit. Yikes! 5: What is your price point? Figure out what you would like the RRP to be of your new product and work backwards to determine your fabric price point. Dyeing, shipping and handling cost also need to be factored in. Small differences on the costs of the fabric multiply considerably once yourself and the retailers mark up the garment. So… now we have that covered: how do we find these suppliers? The best way to source fabrics and components is to visit trade shows that target your particular industry. As you are taking a nosey through the I A Samples website my best guess is that you are wanting to source fabrics for Intimate Apparel garments, which may include lingerie, swimwear, active wear, corsetry or sleep wear. One of the best tradeshows for this market is Interfiliere, which is held in Paris, Hong Kong, New York and Shanghai twice a year. The next show in Paris is July 8,9,10 2017. It is wise to invest at least two days at these shows, as there are a lot of exhibitors to see. Before you go be sure to make appointments with any suppliers you are particularly interested in seeing. In between shows, if I need to source a supplier, I will take a sneaky look through past or future exhibitors on the shows websites or catalogues and contact them directly. Most suppliers are happy to send you samples or allow you to visit their showrooms. If you are based in the UK and developing lingerie or swimwear, then a very useful contact is Contour Specialist Fabrics, which is a family run business, based in Grantham. 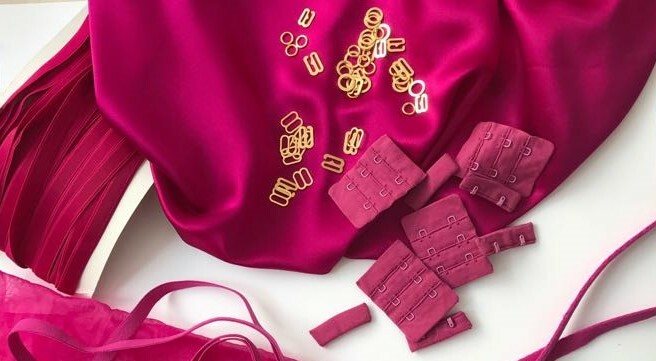 Their range of fabrics and components cover everything you need for intimate apparel garments including foams, silks, power-mesh, lace, elastics, rings, sliders and hook and eyes. All items are there ready to buy immediately and most items have no minimums. Bra wires will most likely need to be sourced elsewhere however as the last time I checked these one of the few things they don’t stock. Bra wires are imperative to the good fit of a bra, basque or under wired swimsuit, so I will delve into the details on how to determine the correct shape of a wire and source these, in a separate blog.